Vinyl and linoleum are two different types of resilient flooring materials that share many characteristics. Many people refer to them interchangeably, due to their similarities. 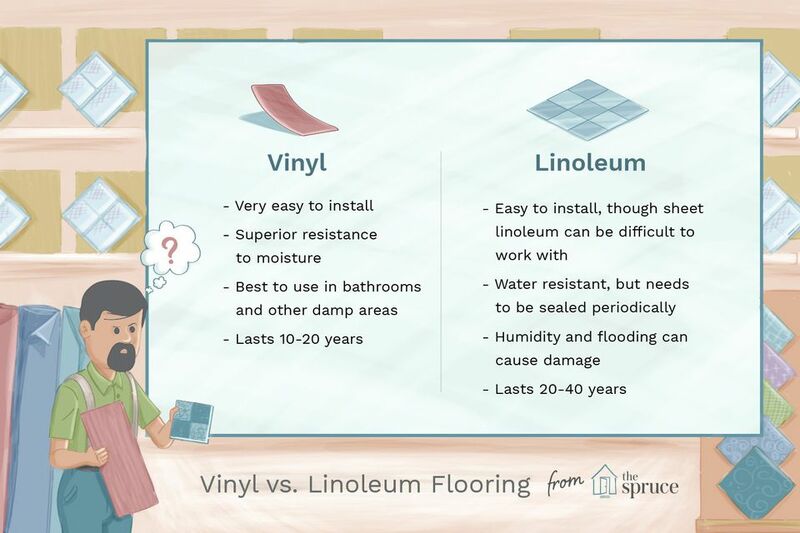 But there are some important differences between linoleum vs. vinyl, including materials and production, installation, appearance, care and maintenance, and cost. Compare all of these characteristics to determine which type of resilient flooring is best for you. Vinyl: A manufactured human-made product that is produced using petroleum, a non-renewable resource. Large amounts of energy are required to extract and process chlorine, a vital component of vinyl's chemical makeup. Linoleum: A material that is comprised largely of linseed oil, a naturally occurring substance that is extracted from flax seeds. This is mixed with other natural and renewable materials, such as cork dust, wood flour, and rosin. Vinyl: Vinyl is generally one of the easiest flooring materials for a do-it-yourselfer to install. Peel-and-stick vinyl tiles and snap-together planks are the easiest types to install, while sheet vinyl takes some careful measurements and cutting. Linoleum: Installing linoleum can be very similar to installing vinyl, but sheet linoleum can be harder to work with than sheet vinyl. Linoleum also comes in tiles and planks that are suitable for DIY installation. Vinyl: Some types of vinyl are virtually waterproof and can be installed in frequently damp environments, including basements and other below-grade areas. Sheet vinyl is the most water-resistant type because it has fewer seams within the main area of the floor. Linoleum: Water resistant, linoleum is not impervious to damage from moisture and needs to be sealed periodically to protect it against liquid penetration. If flooding occurs a linoleum installation can be ruined, and excessive humidity can sometimes cause individual tiles or the corners of sheets to curl. The cost difference of vinyl and linoleum is offset to somewhat by their relative life expectancy. While vinyl can cost 50 percent less than linoleum, it will last an average of only 10 to 20 years. A linoleum floor can last 20 to 40 years or more. Vinyl and linoleum also tend to age differently. Linoleum will show its age over time, weathering away and gradually looking older and older until it needs to be replaced. Vinyl, on the other hand, often maintains a glossy appearance until its wear layer fades and the flooring starts to degrade. Vinyl: With printed vinyl, you have the option of nearly any color, pattern, or image embedded directly into the surface of the material. This allows you to achieve some of the most vibrant and realistic effects of any flooring. The drawback is that the vinyl is only as strong as the wear layer over this print, which will tend to wear down over time. Linoleum: This material is colorfast, which means that the patterns and hues are not just printed on the surface but are dimensionally present through the entire piece. This limits the design options to some degree but allows the flooring to wear down without fading, as the colors are true all the way through the material. Vinyl: One of the easiest floors to keep clean, you can sweep and vacuum vinyl regularly, or mop it with any of a variety of detergents without having to worry about the material discoloring. Resistant to moisture, mold, and mildew, it can be simply wiped clean periodically to keep it looking its best. Linoleum: Almost as low-maintenance as vinyl, linoleum has been a favorite flooring for schools, hospitals, and other public properties for many decades. Just sweep and or vacuum it periodically. Stains can be hand cleaned with a rag and a mild detergent.